Growing chives in an herb, vegetable, or flower garden is one of the easiest and smartest decisions one can make. Related to the humble, yet versatile onion, chives are one of the easiest herbs to grow and the smallest of the Allium family. The pungent aroma of its foliage, flowers, and bulbs help to deter pest insects – a boon in your rose or other highly-valued ornamental garden – and the flowers attract pollinators to help your fruit and veggies grow in production. 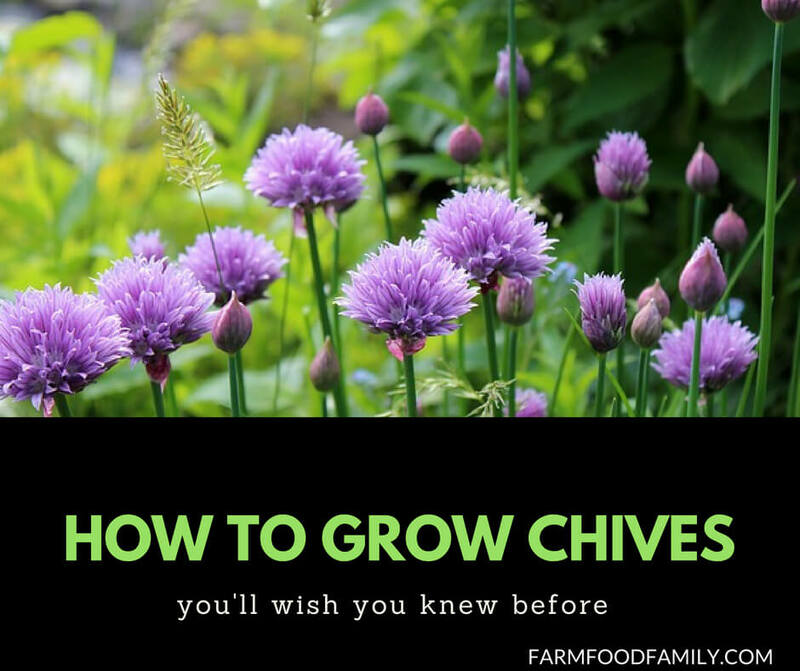 Below you will find a description of the chives plant, including its height, hardiness, and flower; light, moisture, and soil requirements; cultivation tips for keeping your growing chives healthy and tasty; our favorites varieties; and some ideas for how to use chives in your home. Wider than tall (12 or so inches high by as much as 18 inches wide), chives present a marvelously spikey textural relief in the garden. From thick green foliage “straws” arise lovely lavender pom-pom-like chives flowers, irresistible to all manner of bumblebees and other pollinators. Because the chives plant is perennial, it is not sent around the garden rotation with its cousins, garlic and onion, but is best planted in either a dedicated herb or flower garden bed. Because it is so popular with the pollinators, I don’t put it near benches or doors. I like to watch the show, but not sit on it nor invite it inside. Light: Full to part sun. 4 or 5 hours of direct sun a day, minimum. Moisture: Moderate. Err on the drier side if in doubt. Soil: Average soil. Not too rich, but definitely well drained. Starting Chives from seed or bulbs is quite easy, though rooted clumps is the easiest of all. Cultivating Chives: Remove flowers once they’re finished (before they set seed,) lest they steal energy away from foliage production. Consider planting multiple clumps and trading off harvesting from each. This will help prolong the overall life of the plant. Growing clumps can be divided once every 3-4 years to prevent them getting too thick. “Garlic” chives or Chinese chives (Allium tuberosum) has, as you’d think, a garlic essence to its foliage and white flowers. Great on baked potatoes. Pink chives (Allium schoenoprasum var. roseum) have a shorter height than the straight species, but its flowers are a lovely pink shade and highly prized in fresh and dried arrangements. Commonly found in fish and potato recipes, and a staple in soups, chives are also a great condiment seasoning. The flowers too are edible and lovely in salads or as a garnish. Chive straws (leaves) are most flavorful when used fresh, though they can be frozen in plastic containers or bags and used straight from the freezer. Chives are excellent companion plants for roses and other highly prized ornamentals being as they’re thought to deter insect pests like aphids.